Bus from Alor Setar to Butterworth is one of the routes with the most departures in Alor Setar Bus Terminal, which is known as Shahab Perdana Bus Terminal. Bus from Alor Setar to Butterworth is the most convenient transportation option. Passengers prefer bus over train because of the frequent bus schedules as compared to train schedule. Train only provides 1 daily departure, whereas bus has hourly departure from morning till night. Besides frequent bus service, bus fare is about 50% cheaper than train service at train fare of RM 22.00. 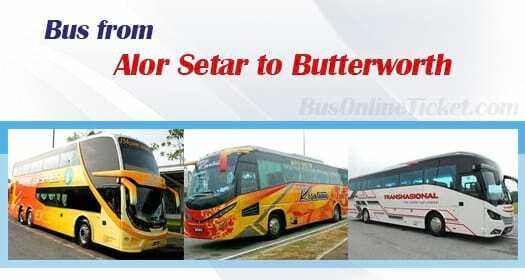 As a result, most commuters are taking bus to Butterworth from Alor Setar. Cepat Express, Kesatuan Express, Konsortium Bas Ekspres (Malaysia), Plusliner and Transnasional are the operators supplying bus from Alor Setar to Butterworth. Their combined trips have total 28 daily departures. The earliest departure goes in the morning 7:30am, while the last one is at night 9:00pm. The travelling time from Alor Setar to Butterworth is approximately 3 hours depending on the road traffic condition on the travelling day. The bus fare varies in a range of RM 7.80 to RM 11.00 depending on your choice of bus operators. The boarding point in Alor Setar is located at Alor Setar Bus Terminal, also known as Shahab Perdana Bus Terminal. The arrival point in Butterworth is located at Penang Sentral Bus Terminal. Penang Sentral Bus Terminal is physically connected to the adjacent Butterworth railway station and the Penang Ferry terminal. Therefore, passengers could easily access to the train and ferry from Penang Sentral Bus Terminal. Booking bus ticket online with BusOnlineTicket.com is simple and convenient. By booking with BusOnlineTicket.com, everyone could avoid getting down to the terminal to buy bus ticket in long queue counter. Instant email confirmation upon payment is received.